Dalmellington is a short mile from the Scottish Dark Sky Observatory in Galloway Forest Park. Sadly, we had rain and did not see the starry heavens. The observatory itself and its astronomers are worth the visit. I will be back. Will I stay at the Eglinton again? Maybe. £30 is cheap! 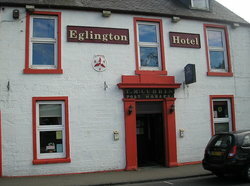 November 2012 The Eglinton Hotel hosted a funeral party. The business of internment done, mourners were having a dram. Crammed into the tiny bar, estimate 53 people, 40 from the funeral party, twelve regulars, and one other stranger-in-town. Punctuating the shouts, a rhythmic byong, byong, byongg, to awaken the dead, sounded like pistol shots. ‘What’s that noise?’ I asked a girl — here for her granddad’s funeral, ‘It’s the builders,’ she said. I looked into a half finished addition. Couldn’t see a joiner, but could hear his nail gun, byong, byong, byonggg. The landlord had seemed unfazed when I remarked it was hard to reach Eglinton by phone. He’d had the place for a year he said but it remained under the phone number of a past owner. I figured maybe the Eglinton was a boutique hotel, an exclusive club that didn’t need to advertise its guest rooms on the World Wide Web — it had a loyal clientele perhaps who’d recommend it, word of mouth, to international travelers looking for atmospheric accommodation in East Ayrshire. A £60 tariff for B & B, continental breakfast not standard, but I could have juice, cereal and milk instead of the Full Scottish. I booked. My room was not en suite In fact the five rooms share two bathrooms, carpeted bathrooms, with falling plaster. Do not mistake me here. I do not mean interior designer falling plaster. I do not mean freshly plastered walls with artful irregularities carved out so the bathroom resembles an elegant room in a fine house of great age, or a fin-de-seicle Viennese apartment, high-ceilinged, romantically going slightly to seed. I mean honest-to-God rotting plaster, under the influence of leaking pipes or holes in the roof tiles, bulging plaster, adorned with rich growths of black mould or, in one particularly egregious case, missing completely behind the toilet tank, where a large rectangle of plaster and tile had been crudely incised and removed with a cold chisel to facilitate the installation of a replacement toilet tank. Now, in defense of the Eglinton, the rates are low. I discovered that the £60 tariff quoted me was in anticipation of me arriving with a man. The rate is £30 pp or £60 for a couple. £30 is very cheap. In fact, in recent years I’ve not had any accommodation that cheap anywhere in the UK nor for that matter have I ever had accommodation of the quality that the Eglinton offers anywhere in the world! I would have been happy to pay an extra £10 to have had heat in the bedroom. The rusted radiators in both bedroom and bathroom (described above) worked intermittently. For my extra £10 I would also have expected a bedside lamp to avoid the inconvenience of getting out of bed to extinguish the overhead light and having to stumble back to bed in the dark. A TV and winter weight bedding would have been nice. But now we are talking luxury items. Thankfully I was clad for the Scottish winter and being a seasoned camper used to sleeping fully clothed. The folk in Dalmellington, a lovely little Ayrshire town , like Scots everywhere (except maybe parts of Edinburgh) are warm, friendly, funny, good-natured, and generous. They welcome strangers to their midst like long-lost siblings. The kind lady at the Café India take out, delivered a delicious (off the menu, just for me) saag, with added fresh potatoes and onion. I’d explained I didn’t eat a lot of meat. Café India’s food is ‘Nippy as a woman scorned,’ so said a Scottish poet I met at the bar. Eglinton’s patient and pretty bar tender brought me plate, silverware and napkins. As the only female in the bar I enjoyed a surfeit of male attention, got hit on by punters from the full age range of legal drinkers and received many offers of ‘free’ bed & breakfast. I hasten to add that I accepted none of them. Why is it that a woman travelling without a man is presumed to need a man? I want to comment, but I don’t even know where to start. You crack me up. You make even bad travel experiences, even ordinary travel experiences sound like adventures worth having. You could make a living being a tour guide to, oh I don’t know, the road less traveled.